Lift truck/forklift news and other MHE information. The company owner was operating a forklift to lift a metal bin which the worker was standing in. When the metal bin was raised in the air, the worker fell through the corroded base of the bin before the bin itself fell from the forklift tines on top of the worker. Read more. Thyssen-Krupp, located in Park City, Kan., outside of Wichita, is a partner for the world’s leading aerospace companies and their supply chains. A big part of the company’s overall efficiency is dependent on its fleet of forklifts. After changing forklift brands, the company reduced maintenance costs while improving safety and operational visibility. Read more. In the first case of its kind in Canada, two workers have been prosecuted for using their cellphones while on forklifts at work. This case demonstrates when the Ministry of Labour (MOL) will prosecute workers under Ontario’s Occupational Health and Safety Act (OHSA) and it shows the ministry’s expectations on employers to enforce zero tolerance policies with respect to cellphone use in potentially dangerous workplaces. Read more. What do warships have to do with forklift trucks? For Kero Uusitalo, these two vastly different vehicles have shaped his working life – combining his childhood dreams and an enduring passion for design. Read more. Just one more reason not to leave the key in the ignition! CHARLOTTE, N.C., Sept. 7, 2018 /PRNewswire/ — RELiON Battery, a leading global manufacturer of lithium iron phosphate (LiFePO4) batteries, announced today the launch of its new online store. In a continued effort to strengthen the brand’s accessibility, enhance customer interactions and increase consumer product knowledge, the RELiON website offers e-commerce functionality for the first time. Online shoppers in the U.S. looking for high performance LiFePO4 batteries for recreational vehicles, boats, electric vehicles, solar energy systems and more can now not only access in-depth technical information on RELiON’s products, but also shop from the comfort of their home. The online store stocks many of the company’s standard LiFePO4 batteries, including a range of 12V, 24V and 48V products. RELiON also offers free shipping on all orders, making sure that customers can take advantage of quick delivery. “Launching our online store is a direct response to requests from consumers for an online shopping experience. Our goal is to offer a seamless customer experience by blending the convenience of ordering standard items in smaller quantities online with technical support to ensure customers get the right solution for their application,” said Paul Hecimovich, CEO, RELiON Battery. RELiON will continue to increase product offering within the online store as the company’s product lines expand and new innovative technology is released into the market. With an assortment of products larger than most online lithium battery retailers, shopping at relionbattery.commakes it easy and convenient for consumers to order a LiFePO4 battery for their high powered applications. “For anyone looking to quickly find an alternative to lead-acid or other traditional batteries, the RELiON online store will streamline the customer buying experience and save valuable time,” added Hecimovich. RELiONBattery.com conveniently accepts all major credit cards and products purchased can be shipped anywhere within the continental United States. For more information on their new online store, visit https://relionbattery.com/products/lithium. July 16, 2018. An accident involving a forklift and a dumpster at the Campbell’s Soup plant in Maxton, NC on Sunday left one man dead and another person with injuries., according to Powder & Bulk Solids. Plant employees told local ABC News affiliate WPDE that a dumpster being moved by a forklift fell, fatally injuring one man. Another worker was injured in the incident and transported by helicopter to a local hospital. The Robesonian reported that the person received injuries while attempting to assist the man who died. July 16, 2018. Doosan Corporation Industrial Vehicle (DIV), celebrating the 50th anniversary of its foundation, introduced a high-tech forklift model BS7 running on lithium-ion batteries. Read more. PORTLAND, Ore. — A truck carrying a forklift hit the the underside of an overpass while traveling north on interstate-5 on Monday afternoon, causing delays as crews work to get the forklift back on the trailer. Read more. 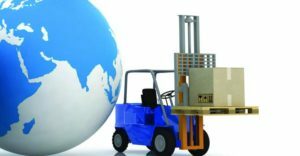 May 15, 2018 – There are said to be roughly 400 forklift manufacturers in the world, of all types and varieties of equipment. No single trade show, no matter how big, could possibly include all of them, but CeMAT 2018, held in late April on the sprawling exhibit hall campus outside of Hannover, Germany, included a couple dozen forklift suppliers from the continents of Europe, Asia and North America. Read more at MH&L. 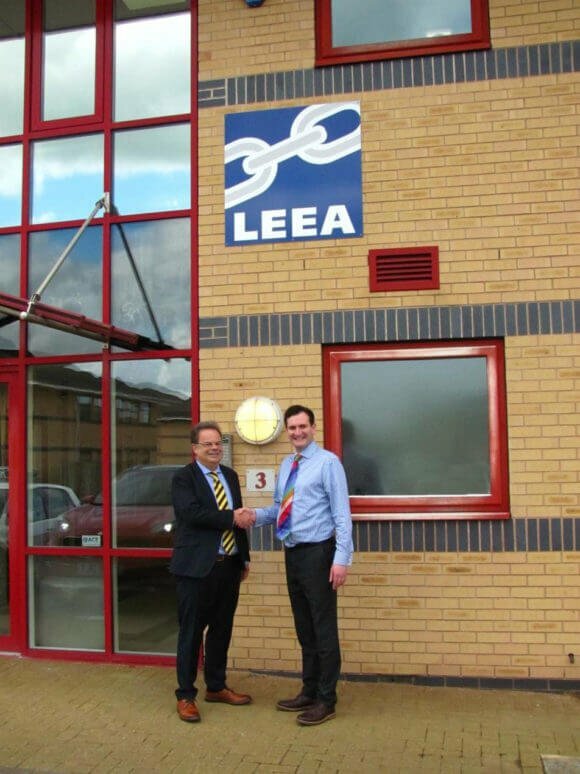 May 15, 2018 – The Lifting Equipment Engineers Association (LEEA) CEO, Dr Ross Moloney, recently met with Tim Whiteman, CEO of The International Powered Access Federation (IPAF), and Richard Whiting, UK Market General Manager for IPAF, to discuss shared approaches for supporting members as well as exploring opportunities to work closely together in the future across the sector. IPAF promotes the safe and effective use of powered access equipment worldwide through technical advice and information, influencing and interpreting legislation and standards, and safety initiatives and training programmes. The not-for-profit organisation is owned by its members, which include manufacturers, rental companies, distributors, contractors and users. IPAF members operate a majority of the Mobile Elevating Work Platfrorms (MEWP) rental fleet worldwide and manufacture about 85% of platforms on the market. April 5, 2018 – Toyota Forklifts, a leading forklift manufacturer in North America, announced a new marina truck option for select models of its THD pneumatic forklifts. The fully-customizable marina truck option helps lift boats out of the water or transfer them from one location to another more efficiently than traditional methods. It’s a great solution for marinas, boatyards, dry stack facilities and any customer who launches watercraft. The marina truck option boasts a lift capacity up to 55,000 pounds with load centers designed for the unique balance of watercraft and mast options with a negative lift of down to 20 feet. Equipped with features designed for marine environments including galvanized epoxy coated carriages and padded rotating forks to protect boat hulls, the marina truck option makes lowering and lifting boats out of the water and moving them in and out of storage a smoother process. Toyota’s latest marina truck option also features a 7-inch touch-screen multi-function display with a capacity estimator and an optional wireless remote control for operating the forklift outside of the normal seating position. The new marina truck option is available now to order. For more information, visit ToyotaForklift.com. Lexington, KY – April 2, 2018 – CLARK Material Handling Company today announced it has appointed Pacific Material Handling Solutions, Inc. (PMHSI) as an authorized distributor of CLARK products in the San Francisco Bay and Northern California markets. “Pacific Material Handling Solutions, Inc. is part of the Pacific Solutions group of Companies that provides Material Handling, Commercial Truck, Rental & Leasing solutions to their customers while focusing on long-term customer relations by providing cost-effective solutions. We are excited to have them join our dealer network,” commented Dale Guckian, CLARK’s Director of Dealer Development. “We are extremely excited about our new affiliation with CLARK Material Handling and its rich tradition to the material handling industry. The CLARK organization provides Pacific the opportunity to bring increased value to our customers and aligns with our 24-7-365 commitment to our customers, associates, and partners,” commented Ralph Logan, Pacific’s President/CEO. PMHSI will support its CLARK new equipment, aftermarket parts, and service efforts out of its facilities located in Union City, Sacramento, Stockton, and Modesto, California locations. Additional information can be found on the web at www.pmhsi.com or by calling (510) 429-0303. Holt of California remains an authorized distributor of CLARK products in the Sacramento, CA markets with facilities in West Sacramento, Stockton, Yuba City, and Redding, CA. Holt is a full-service material handling dealer featuring full sales and service departments. Storage Equipment Safety Service returns bringing its 31 years of expertise in Rack and Shelving Safety Inspections and Training to the North American Market. SESS states it is the market leader in independent rack safety inspections covering the UK, Ireland, Europe, North America and the Caribbean. SESS USA LLC is passionate about ensuring that all warehouse users operate in a safe environment, which allows them to return home safely to their loved ones. Years of working with warehouse and health and safety personnel have identified a need to educate and raise the awareness of end users on the correct and safe use of racking and shelving. Post-Installation inspections are done to ensure that racking has been installed according to manufacturer specifications. Post-Modex will see the re-introduction of the company’s online store and our safety blog which will assist in raising the awareness for rack safety and assist in educating their customers on information pertinent to rack and warehouse safety. April 5, 2018. Sant’Antonino, Switzerland. Interroll, leading global provider of material handling solutions, announces today that Dr. Ralf Garlichs, Executive Vice President Products & Technology and member of Interroll Group Management, has decided to leave the company by the end of June. Garlichs, 55, joined the Interroll Group in 2006 as Executive Vice President Drives & Rollers. Since 2011, he has been Executive Vice President Products & Technology and a member Interroll Group Management. The successor of Garlichs will be announced at a later date. Hannibal Industries, Inc., a world-leading manufacturer of steel pallet racks for the material handling industry, today announced its cantilever racking system has been successfully installed in Western Window Systems’ new warehouse through Handling Systems. Western Window Systems and Handling Systems worked closely with Hannibal to obtain permits, design concepts and development to complete the installation ahead of schedule. Hannibal Industries Cantilever Racks are ideal for storage of long, bulky products and are available in heavy-duty structural or medium duty roll-formed design. Additional information on Hannibal Industries is available at http://www.hannibalindustries.com. December 4, 2017. Chamberlain Group acquires Systems, Inc.
Oak Brook, IL-Chamberlain Group (CGI), a global leader in access solutions and products, has acquired Systems, Inc. (SI), one of North America’s leading dock-leveler manufacturers. Sohovich noted that Sl will continue to operate as they do now, with their President, Mike Pilgrim continuing to lead the dock-leveler business. December 4, 2017. Eberspaecher Vecture: Intelligent battery solutions for Industry 4.0 and logistics. Woman injured after forklift tips and falls from dock. A woman was taken to hospital after her forklift tipped over, falling five feet from a dock. She was restrained by the use of her seatbelt. Buffalo Forklift to Consolidate in Amherst. 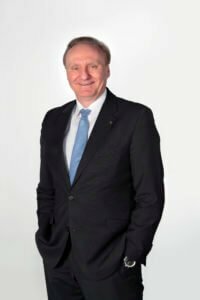 Dr. Thomas Toepfer, CFO of KION GROUP AG, will be leaving the company on March 31, 2018. He will be joining Covestro AG in Leverkusen, one of the world’s leading polymer material manufacturers, in the same role. On Monday, the Supervisory Board of KION GROUP AG agreed to Dr. Toepfer’s request to have his contract – which would have run until August 31, 2020 – terminated early. The Supervisory Board will decide on his successor very soon. November 7, 2017. Wajax celebrates 50 years as Hyster distributor. 2017 marks the 50th year of the business relationship between Wajax and Hyster Company, who celebrated the occasion with a series of events across Canada as well as with the introduction of new warehouse products and the latest Class V internal combustion pneumatic forklifts. November 6, 2017. Researchers work on autonomous forklift trucks. The European consortium behind the Iliad Project is working on the development of autonomous forklift trucks. The team, which consists of robotics specialists from the UK, Sweden, Italy, and Germany, has been working on the project for four years and believes the machines can support tasks such as packing, palletizing and transporting goods. October 29, 2017. Forklift battery technology is a top priority for the future. Battery technology has emerged as the top technical challenge for the future by forklift truck operators, dealers and the wider industry according to early results from a new national survey being undertaken by FLT manufacturer TCM. Warehouse logistics needs to run quickly when goods rotation is high, especially when it comes to perishable food products. Belgian third-party logistics provider Weerts Supply Chain S.A. therefore relies on the pick by vision solution from logistics IT developer Picavi. In its central warehouse near Liege, Weerts currently uses fifteen pairs of Glass Enterprise Edition to pick orders for American food giant Mondelēz. 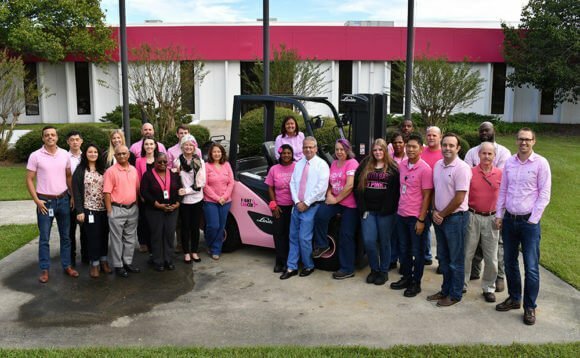 In addition their financial contribution, the company is displaying a pink forklift in front of their facility and employees have been encouraged to wear pink on each Tuesday throughout the month of October. KION North America is a member of the KION Group, one of the world’s two leading manufacturers of industrial trucks and the world’s largest manufacturer of electric forklifts. The company, which employees an estimated 200 employees, has been in operation in Summerville, S.C. since 1985. In addition to comprehensive course information, Columbus McKinnon’s new training website provides information on the company’s professional trainers as well as its training locations, including the state‐of‐the‐ art Niagara Training Center and Rock Lititz entertainment center of excellence. There is even hotel and flight information available for easy and convenient trip planning. The site also features downloadable safety resources, like a Hoist Pre‐Operational Inspection Checklist, that riggers, plant managers and safety supervisors can share and post at their facilities. October 17, 2017. Worker dies in serious incident at Swift Caravans. A UK worker was fatally injured in a collision involving a forklift. October 13, 2017. Newmarket Company Fined $135,000 After Worker Fatally Injured by Forklift. A temporary worker was critically injured and later died after being struck by a forklift in an area that was shared by both forklifts and pedestrians. The Ontario Ministry of Labour’s investigation found that the walkway was a shared pedestrian and forklift aisle frequently used as a traffic corridor in both directions. There were no pedestrian crossways, stop signs, mirrors, walkways or barriers separating pedestrians from forklift traffic, and there were no identified crossing points along the aisle to make pedestrian movement more predictable and easier to anticipate. A Ministry of Labour ergonomist conducted a line-of-sight assessment and concluded that there had been an insufficient distance for the forklift operator to safely bring the forklift to a stop before the impact with the worker. Also, there was a ‘blind spot’ area, and the forklift operator had not been speeding. Empty bins were stored two high adjacent to the yellow lines on the floor in the surface line area. The line-of-sight assessment indicated that the storage of empty bins adjacent to the yellow lines on the floor in the surface line area was a contributing factor to the incident. The location and height of the bins limited the sight lines available to the forklift operator by effectively blocking part of the view. September 18, 2017. Silver Jubilee — Mitsubishi releases special edition warehouse and forklift trucks. September 11, 2017. Pallet-Track to roll out cameras on its forklift trucks after successful trial. Leading logistics company Pallet-Track is rolling out more than 100 bespoke high resolution cameras for its fleet of fork lift trucks (FLTs) to help drive increased efficiencies and protect its unparalleled industry record of never losing a consignment during its 13-year history. The company moves more than 20 million pallets annually. September 6, 2017. Tougher new test for UK fork lift operators comes into force. From the 1st September, anyone training as a fork lift truck operator will find the test considerably tougher than ever before. September 1, 2017. Forklift Foils Gravity’s Effects. Toyota’s System of Active Stability (SAS) was designed to directly improve vehicle stability by automatically stabilizing loads during high lifting and reducing the possibility of the forklift and its load tipping over as it turns. August 29, 2017. Hyster lowers handling costs for paper recyclers. The collection and recycling in Europe increased by almost one million tonnes of paper in just 5 years. As the industry continues to grow, Hyster Europe claims that it can help even the most intensive paper recycling operations reduce cost and maximise efficiency. August 26, 2017. When Automation Doesn’t Bring Layoffs. UniCarriers Americas, a subsidiary of Kyoto, Japan-based Mitsubishi Nichiyu Forklift, employs 600 workers at its plant 75 minutes northwest of downtown Chicago. Though the plant has automated more and more production in the past five years, no workers have been laid off. In fact, headcount has doubled since 2012, and the company has spent $1.1 million to retrain employees for other jobs within the factory. August 23, 2017. Massive Forklift Used to Steal ATM. Closed circuit television captures the heist. August 18, 2017. Schoolboy who stole forklift truck and went on a two-hour rampage escapes a PRISON sentence. The 15-year-old, who was also carrying a rifle, stole the industrial machine from a farm shop before setting off along country roads in the late evening last September, a court heard. He recklessly crisscrossed lanes around Sonning Common and Cane End near Henley-on-Thames in Berkshire at speed before maneuvering the prongs under the chassis of a blue Fiat Punto before tipping it onto its side, writing it off. August 15, 2017. Hyundai Construction Equipment’s has launched the newest of its all-around heavy-duty diesel forklifts – the compact but powerful 160D-9L. The new truck fills the gap between the 160D-9 and 180D-9 and offers an increased load capacity, extra safety, cost-effectiveness and operator comfort. August 7, 2017. Forklift Operators: Drivers of Change. August 7, 2017. Delivery driver who had leg ‘crushed’ by forklift truck at work sues for £300k. August 3, 2017. Man Heralded After Spotting Runaway Forklift. Augusts 3, 2017. Food firm fined for forklift accident. A manufacturer of prepared meals has been ordered to pay more than £100,000 for safety failings, fter a worker fell 6m off the back of a forklift truck. August 3, 2017. Ontario’s Concord Premium Meats Ltd. has been fined $55,000 for a forklift accident at its Brampton, Ont. plant. The incident took place in May 2013 and involved a shipper/receiver operating a walkie forklift. According to the Ministry of Labour, the young worker was moving meat with the small forklift and collided with materials being moved by a co-worker. The worker suffered a broken ankle during the accident. August 2, 2017. Hydrogen-powered vehicles are finally taking off—inside Amazon and Walmart warehouses. In the last few months, Plug Power has struck two $600-million deals. One with Amazon for forklift fleets in 11 warehouses, and another with Walmart for the same in 10 warehouses. (Walmart is already using Plug Power forklifts in 22 warehouses). August 2, 2017. E Instruments has introduced the F900 Carbon Monoxide Exhaust Analyzer. This device is designed to accurately measure CO from forklifts and small engines for CO safety testing, pre-compliance testing, and engine tuning and maintenance. The F900 is now available with a wireless Bluetooth printer, which allows users to print on-site exhaust analysis reports. July 28, 2017. Top 6 Forklift Mobility Trends. In case you are wondering, these include alternative power, low resistance and non-marking tires, safety, lift scales, Internet of Forklifts, and compact platform. July 26, 2017. Winnebago plant in Middlebury fined $10,000 following worker’s death. The Indiana Occupational Safety and Health Administration has fined the Winnebago plant in Middlebury $10,000 for workplace violations after a 54-year-old employee was run over and killed by a forklift in April. Two serious violations were noted: A windshield was installed on a forklift, which affected it’s operation, and the forklift wasn’t operated at a safe speed. July 23, 2017. Teen Worker Run Over by Forklift. July 22, 2017. Plug Power shares jumped as much as 19% in response to an announcement that the company had expanded its relationship with Wal-Mart Stores, Inc.
July 21, 2017. Port of Tilbury is London’s major port and operates on such a large scale it needs its own on-site, resident engineers to ensure the continual running of vital equipment. FSDF member Briggs Equipment is able to offer a 3 hour response time to breakdowns thanks to its nationwide fleet of service engineers, however the expectations of a busy port are even more immediate and the Port remains one of the company’s longest standing examples of providing a resident team to help a customer achieve their productivity goals. July 19, 2017. A worker at a UK building site was potentially seriously injured when he was crushed between a forklift and a post. He was airlifted to a London Hospital. July 18, 2017. The AC-powered forklift market is expected to grow at 6.5% CAGR through 2021. The new BCC Research report also notes the major applications of forklift trucks are distribution centers and warehouses, accounting for 27.5% and 25.2%, respectively, of the 2016 global market. In response to consumer desire for ever-shorter delivery times, e-commerce companies are seeking warehouse spaces near urban areas. As the demand for distribution centers increases, the demand for forklifts is expected to jump during the forecast period. BCC Research projects that the global forklift truck market will grow from $41.9 billion in 2016 to $56.3 billion in 2021 at a 6.1% CAGR. July 17, 2017. EnerSys® NexSys® TPPL (Thin Plate Pure Lead) technology batteries have been chosen by Kuehne+Nagel to power vehicles at a new warehouse in Turkey, eliminating gas emissions and thus increasing safety and reducing time loss on battery change. July 13, 2017. Brazen cash machine thieves use a forklift to smash through building society wall and escape with the loot. CCTV footage captured a Bobcat telehandler ramming a building three times before lifting free an ATM and placing it onto a pick-up truck. Click image to watch. July 12, 2017. A Mississippi man was fatally injured while pressure washing a building. He was standing on a forklift platform when the forklift tipped. June 27, 2017. Drunken Rampage. A 20-year-old man Ontario man is facing numerous charges after allegedly stealing a forklift while drunk and taking it on a destructive drive, according to the Toronto Sun. When police arrived they found damage to property and trees, as well as overhead wires which were pulled down. June 25, 2017. Forklift safety training is critical. An article from the National Safety Council stresses the importance of forklift training. Online or e-learning for forklift training can be beneficial for the classroom portion of the instruction delivery. Here are pros and cons to consider. According to OSHA requirements, a forklift operator must be at least 18 years old, as well as trained and certified in order to drive a forklift without the direct supervision of a qualified trainer. In addition, lift trucks can only be operated when authorized by your employer. Forklift operators must be trained in forklift operation, general safety and equipment management procedures. Typically, employers arrange mandatory training for their employees either in their own facility, at a training provider location or online. Individuals interested in obtaining a forklift operator job may undertake training from a training provider on their own to improve their chance of being hired for a forklift operator position. When you are just talking about the classroom portion of the instruction. OSHA forklift training requirements include formal (classroom) instructions, practical training and finally the evaluation of operator’s performance. So, clearly, the second and third requirements can’t be fulfilled by an online course. Formal instructions, however, can be effectively delivered through e-learning. When you can’t afford to spare a qualified operator to provide the training. When volume spikes or unplanned absenteeism get entered into the equation, all too often the scheduled trainees can report to work for training but be left without a trainer. Online instruction eliminates this risk of lost training hours. When there is uncertainty as to when the time will be available to do the training. On demand e-learning courses can be undertaken as time permits. Training can be undertaken anytime. When the qualified operator who performs your practical training and evaluation isn’t comfortable providing classroom instruction. Some operators make excellent practical trainers but aren’t cut out for the formal instruction aspect. When there are available computer stations to accommodate trainees. Obviously, without terminals and an adequate Internet connection, e-learning is a poor idea. When your intent is to provide practical hands-on training and evaluation of operator performance. Online instruction is only permitted for formal instructions. When you believe it is more beneficial to have your practical trainer spend the additional time with trainees to get to know them better before they get aboard a forklift during the practical portion of training. When you are looking for opportunities for employee growth and development. Organizing and delivering the classroom forklift training content can provide a useful teaching and mentoring experience for the trainer. When you are looking for every opportunity to instill the company’s values. If the trainees are new hires, it can be worthwhile to have the formal training done by a trusted employee rather than an online service. When you are at risk of IT problems such as slow internet connection. When you cannot justify the expenditure on computer stations to allow online learning, or when the online training cannot be run without risk of interruptions while it is session due to the location of the computer stations. Online forklift training can be a good option to cover the classroom requirements for forklift operation. Online courses from reputable providers are designed to be thorough and engaging. They may be visually appealing, and interactive. They provide the opportunity for the trainee to work at his or her own pace, and of course, the results of training are recorded to aid in your training recordkeeping. To reiterate, however, practical, hands-on training and evaluation of operator performance must take place in the operating environment and include instruction on dealing with site specific risks that would be beyond the scope of an online course. Recently HELI has launched a new heavy-duty electric forklift into the market with a loading capacity of 10 tons. This new battery powered counterbalanced forklift truck ensures that companies with loading needs of up to 10 tons get an eco-friendly and noiseless solution with features that significantly reduce the running costs by improving safety and environmental performance. The new 10T electric forklift provides optimal safety, are environmentally friendly, efficient, ergonomically designed and suited for many different lifting applications from general manufacturing, logistics and warehousing to many more outdoor uses. “As HELI, the famous manufacturer of heavy-duty forklift trucks, we have decades-long experiences. The result is that we applied our skills to develop electric trucks with performance matching the current powerful diesel trucks, but much quieter, completely free from emissions and lower vibrations. Like all current HELI trucks, they come with excellent value through safety, productivity and performance” said Zhang Jie, design engineer for HELI electric forklift trucks. The vehicle adopts a new streamlined design, the appearance becomes smoother and more beautiful, super-low center of gravity offers the driver with an excellent rear vision field. On Tuesday, Aug. 1, Mitsubishi Caterpillar Forklift America Inc. (MCFA), the provider of Jungheinrich® lift trucks and narrow aisle products in the United States, Canada and Mexico, and Jungheinrich® Lift Truck Corp., celebrated the successful grand opening of a new joint venture, Industrial Components of Texas, LLC (ICOTEX®). Located at 3479 Pollok Dr. in Conroe, Texas, ICOTEX’s new 71,000-square-foot facility will manufacture industrial components. Nearly 200 attendees joined the grand opening celebration, including executives from Mitsubishi Nichiyu Forklift Co. Ltd., MCFA and Jungheinrich AG, as well as ICOTEX employees, town officials and other key colleagues and supporters. The event included a ribbon-cutting ceremony and facility tours, showcasing ICOTEX’s new state-of-the-art equipment used in the manufacturing process. The factory’s capabilities include plasma cutting, bending, machining, welding, powder coating and more. ICOTEX is projected to employ approximately 80 people in the future, including manufacturing and office personnel. The facility will produce forklift components, which will be supplied to MCFA for use in MCFA’s Houston manufacturing plant. The benefit is an uninterrupted supply of forklift components, and therefore faster production and delivery of forklifts built on MCFA’s Houston campus, just 50 miles from ICOTEX’s factory in Conroe. Continued growth expected in Walmart’s use of Plug Power hydrogen fuel cells in its distribution center material handling fleet. Walmart granted right to purchase Plug Power equity, vesting based on future business. Plug Power Inc., a leader in providing energy solutions that change the way the world moves, has announced a new collaborative agreement with Walmart to facilitate further expansion of its ongoing relationship with Wal-Mart Stores, Inc. The new agreement includes revised deal terms with Walmart that allow Plug Power to access project financing at a lower cost of capital and no restricted cash, making Plug Power’s future distribution transactions with Walmart cash flow positive up front. Plug Power expects to provide its GenKey hydrogen fueling station and fuel cell energy solutions to up to 30 additional Walmart sites in North America over the next three years, with ten sites already under contract and scheduled to be finished by the end of 2017. The value of these 2017 commitments is expected to be around $80 million. On average, Plug Power has deployed a new Walmart site every 6 weeks since 2014, resulting in a deployed fleet of 5500 Plug Power fuel cells at 22 of Walmart’s U.S. distribution centers as of the end of 2016. As part of the agreement, and as an incentive to align Walmart’s future business with Plug Power’s growth and success, Plug Power has granted Walmart warrants to acquire up to 55,286,696 of Plug Power’s common shares. Warrants for the first 5,819,652 shares vested upon execution of the new program agreements at an exercise price of $2.1231 per share, which is based on the volume weighted average closing price of Plug Power common shares for the thirty trading days ending July 19, 2017. Additional warrants will vest in installments tied to successive $50 million payment thresholds, up to a total of $600 million in the aggregate, made by Walmart in connection with qualified purchases of goods and services from Plug Power. The exercise price for warrants vesting after the first 34,917,912 warrant shares will be based on the volume weighted average closing price at the time that such warrants vest. The details of the warrants and vesting are described in more detail in a report on Form 8-K filed by Plug Power with the SEC earlier today. The new agreement is a key milestone in a longstanding relationship with Walmart, which has been at the forefront of fuel cell technology adoption and commercialization in material handling, becoming Plug Power’s first GenKey customer in 2014. Plug Power supplies the retail giant with fuel cells, hydrogen fueling stations, and ongoing maintenance services. Today, Walmart operates the largest fleet of hydrogen fuel cell powered electric vehicles in the world, totaling more than 6,600 units in distribution centers across North America. Plug Power’s hydrogen fuel cell technology replaces traditional lead-acid batteries, helping customers increase warehouse productivity with a more energy efficient solution while reducing the costs and sustainability issues related to traditional battery maintenance. Forklift batteries cost $1,500 to $5,000 a piece. So, not giving importance to the proper maintenance might result in great financial loss or higher operating expenses in your business. Nearly all lead-acid forklift batteries provide approximately 2,000 charge cycles. This means a battery normally lasts around 5 years. But to have the maximum service life of a forklift battery, you need to take proper care of it. Without proper maintenance, your forklift battery may not even last 5 years. You can expect to use a battery longer than 5 years if you strictly follow the forklift battery handling and maintenance best practices. People tend to charge forklift batteries whenever they feel convenient, known as “opportunity charging.” But this is a poor practice as forklift batteries should be charged only to certain degrees and at certain times. You should charge the battery until it is full every time it dips below 30 percent charge. It is important to note that both undercharging and overcharging a forklift battery can considerably lessen its life span. The best way to charge is having a fixed charge cycle and not interrupting the cycle. Never charge a forklift battery twice a day as it can cut its service life in half. You must regularly equalize wet or flooded cell batteries. When the battery acid gets more concentrated at the bottom of the battery, the equalizing process reverses the chemical stratification. Acid and water stratification make it harder for the battery to hold a charge. Proper equalizing eliminates sulfate crystals from the plates of the battery and rebalances the electrolyte concentration. Equalizing is possible only when a battery charger has an equalizing setting. While maintenance specifications can vary from battery to battery, most batteries require equalizing almost every 5 to 10 charging cycles. Make sure you check the specifications before initiating the equalization process. To work properly, forklift batteries require the perfect amount of water. Every 5 charge cycles, open up the battery to check the fluid levels. Check 2 to 3 battery cells and make sure that there is sufficient fluid to cover up the plastic element of the battery. In case if you are not sure checking only 2-3 cells, check all the cells and be sure about the fluid level. If you find that there is not sufficient fluid, you need to add water. Roughly every 10 charge cycles, you need to check the water level and add water to maintain right water level. Just top off the fluid in the battery and add sufficient water to cover the plastic element protector of the battery. Just like not adding water when needed is harmful, adding extra water can be equally harmful. It is important to note that maintenance-free batteries are required to be topped off. Make sure you top off the battery only when it is fully charged. Adding water before charging the battery is a common mistake. Between 5 and 7 on the pH scale is the recommended limits for impurities. Remember, putting impure water into the battery can lead to damage of the battery. The temperature not exceeding 45℃ (113℉) is regarded as safe temperature to keep forklift batteries. For optimal cooking, try to ensure enough air circulation in and around the battery compartment. Charging a battery in extreme heat or cold can damage the battery and its service life. If you want to be 100% sure about the perfect temperature to keep and charge the battery, contact the manufacturer because the temperature can vary from battery to battery and model to model. Having a designated area for charging the forklift battery is an OSHA-recommended best practice. Keep the room well ventilated. Make sure there is no open flame or smoking near batteries. As forklift batteries are quite heavy, do not allow a single person to move a forklift battery. Use special equipment such as walkie pallet jack equipped with a transfer carriage to move the battery. At least once a month clean the battery with battery cleaner or warm water. Not cleaning the battery can cause faster self-discharge, voltage tracking, tray corrosion and even affect the electronics within the forklift. Some manufacturers waive the warranty if they find forklift batteries unclear. It is recommended that the workers wear steel toe work boots to ensure their safety while handling a forklift battery. Having necessary arrangements for eye and hand washing nearby too are recommended to avoid health risks of the workers. Workers must wear chemical-resistant gears as well. Lead-acid battery cells contain a large volume of sulfuric acid, which can be the reason for serious chemical burns on human skin. Never keep any metal objects on batteries as batteries are electrically live all the time. Metal objects can catch electricity and cause accidents. Always allow the battery enough time to cool before recharge or discharge. Never add acid or any other solutions to the battery. And never allow unauthorized representatives to service the battery. To prevent arcs and sparks, always turn off the charger before disconnecting the battery. A review of the 7 forklift classifications. By 1927, forklifts had evolved to include back tilt. Source: Palletizer Magazine. These days, forklift trucks are integral to material handling in manufacturing plants, distribution centers, and other operations. The first ever lift trucks were developed in the early 1900s. In fact, early models didn’t have forks at all. They had a single lift plate. As such, the earliest skids did not have a center stringer to accommodate the early lift truck. But forklifts have improved significantly over the years. Those in use today have evolved tremendously from those early beginnings. Used in versatile applications, electric motor rider trucks are equipped with either pneumatic tires or cushions. The pneumatic-tired lift trucks are good fits for use in dry outdoor applications. On the other hand, the cushion-tired motor rider trucks are made for indoor use on smooth surfaces. Powered by electric batteries, these lift trucks use transistor motor controllers to move and hoist functions. Air quality factors are important considerations when choosing an electric motor rider truck for indoor use. These lift vehicles are mostly used in storage facilities and loading docks. Most of these lift trucks are counterbalanced rider type. Three Wheel Electric Trucks also fall under this category. Made for use in narrow aisle operations, narrow aisle trucks allow operators to maximize their use of storage space. Because they can operate efficiently in narrow passageways, storage racks can be set closer together than they could be in a conventional facility, providing greater storage capacity. Reach type outriggers, order pickers, side loaders and turret trucks are examples of narrow aisle electric motor trucks. These are comparatively smaller capacity lift trucks that run on industrial electric batteries. As the name suggests, this kind of truck is hand controlled. The lift controls of the truck are mounted on top of the tiller and the operator moves the tiller side to side to navigate the truck. They are frequently used for palletized loads both in low and high lift operations. Used indoors on smooth dry surfaces, these lift trucks are used for transporting palletized loads. These forklifts are commonly used in storage and load areas. As cushion-tired lift trucks are lower to the ground than pneumatic-tired lift trucks, cushion tired internal combustion engine trucks are used mainly in low clearance applications. Most commonly used in warehouses, these lift trucks are used both indoors and outdoors for many different types of applications ranging from a single unit load to a 40-foot container. These lift trucks are available for use with compressed natural gas, diesel, gasoline and LPG as well. Very versatile in operations, these lift trucks have options to power using both internal combustion and electric engines. For indoor use, electric power is preferred. For outdoor use, the powerful internal combustion engine is used. These are quite large lift trucks with huge floatation type tires. These trucks are capable of working on difficult outdoor surfaces. They are quite frequently used in large construction sites for lifting building materials. Auto recyclers and lumber years too frequently use rough terrain forklift trucks. When deciding to buy either a new or used forklift, there are several factors to weigh. Forklifts are expensive machines, so do your homework before you make a buying decision. Given an unlimited budget, everyone would like to have a shiny, new forklift with the latest technology, but for a lot of operations, the decision of whether to go with new or used mobile equipment is a difficult one. There is no easy and straightforward answer to the question of whether to buy new or procure a used unit. Take the time to assess the pros and cons of both options before you make a final decision. An electric warehouse forklift with standard capacity like 5000 pounds will cost you $15K-$25K. You need to spend another $2k to $5k for a battery and its charger. A brand new internal combustion (IC) forklift with similar capacity can cost as much as $30k. A high-end forklift that can handle even 35,000 pounds at a time can cost more than $100k. On the other hand, a used but well refurbished used electric forklift with 3000-pound capacity will cost $5k-$10k. A similar capacity IC forklift will cost $10k-$15k. So, going for a used forklift, you can expect to have 30% to 50% cost savings. But cost saving should not be the only factor when deciding whether to buy new or used forklifts. Buying a new forklift allows you to have the newest and latest model in the market. You pay the listed price with no need for bargaining. A new forklift should last longer and handle long hours at an efficient pace under proper maintenance. All the parts of the forklift will be brand new contrary to used forklifts. You get precisely what you want. You get a 12-36 months warranty. Huge cost saving (30%-50% less than brand new forklifts). You normally don’t get a forklift as per your desired specifications and forgo some features. You don’t get the newest model in the market. The price valuation of the used forklift is important. If you do it wrong, you might lose big in the bargaining. Won’t work as efficiently as a new one. No or very limited warranty. According to experts, buying a used forklift is a good idea if the required daily use of the forklift is less than 4 hours. If you plan on using a forklift for more than 4 hours a day, it might not perform well for long enough. Still, the used forklift needs to be in good condition. It requires exceptional valuation and negotiation skills to buy a used forklift. Again, there remains the risk of buying from an uncertified seller. Buying a forklift from an individual is always risky. So, consider finding a certified dealer before you proceed. Availability of used and refurbished forklifts is another important consideration. As mentioned before, when the required daily use of the forklift is more than 4 hours, you consider a new forklift. The 12-36 month warranty is a very important advantage that is money well spent for such heavy use.